For determining the DBMS of the year, we subtracted the popularity scores of January 2015 from the latest scores of January 2016. We use the difference of these numbers, rather than a percentage, because that would favor systems with a tiny popularity at the beginning of the year. The result is a list of DBMSs sorted by how much they managed to increase their popularity in 2015, or in other words, how many additional people started to communicate about it in one of the ways we measure in our methodology, for example job offers, professional profile entries and citations on the web. Oracle is the clear leader in the DB-Engines Ranking since we started more than 3 years ago. Its ranking score saw some ups and downs in that period, but 2015 was an exceptionally good year for Oracle, gaining 56.9 scoring points. While Oracle was always very strong in ranking categories such as job offers and LinkledIn profiles, last year it was catching up in its relatively weaker categories such as StackOverflow discussions and Tweets. MongoDB was the winner in 2014 and 2013. 2015 was also a very good year for MongoDB. It saw its ranking score going up by 55.1 points, which is only a tiny gap to Oracle. MongoDB also gained one rank in 2015, overtaking PostgreSQL and now ranking at 4th position as the most popular NoSQL system. Cassandra gained 32.2 scoring points in 2015, which secured the third place. Cassandra was already in the top three in 2013 and is steadily gaining popularity as the leading wide column store at rank 8 in the overall ranking. We congratulate Oracle, MongoDB and Cassandra for their success in 2015. 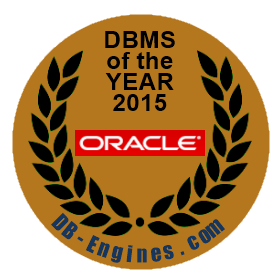 After two victories of a NoSQL system, it is very exciting to see a traditional RDBMS winning this year. Outside the top three, other RDBMSs did also very well this year, most notably PostgreSQL, MySQL, SQLite and MariaDB. Is this an indication for the end of the NoSQL hype? No, for three reasons: First, considering the number of projects that use NoSQL systems nowadays, many of them very complex and mission-critical, it is not justified to call it a hype, probably never was. Second, although a RDBMS won our DBMS of the Year award this time, NoSQL systems are still doing very well in our ranking. Besides MongoDB and Cassandra, other leading NoSQL systems such as Redis, Neo4j and Couchbase also had a very good year. And third, if anything comes to an end, then it's probably the strict distinction between RDBMS and NoSQL. Oracle supported non-relational elements such as collections long before the term NoSQL has been invented. Profound JSON support in traditional RDBMSs became the rule rather than the exception, thus closing the gap to document stores. On the other hand, NoSQL systems today look quite different to the ones 5 years ago, as the system providers reacted to their user's needs to support more complex scenarios and use cases. Even the SQL-like languages that pop up everywhere come very close to the power of SQL, for example N1QL, while still supporting the non-relational aspects of their systems. Let's see what DBMS trends 2016 has in store for us. Dev Ittycheria, President and CEO of MongoDB: "As the market rapidly expands and evolves, MongoDB remains the top non-relational database on the market. We power the broadest range of mission-critical applications and integrate deep within the modern CIO’s technology stack - a huge achievement. 2016 will be an exciting year for us as we introduce new features and capabilities that will continue to position MongoDB as the default database for new and existing workloads." Patrick McFadin, Chief Evangelist for Apache Cassandra: "What an amazing validation of a great year for the Apache Cassandra community. More and more, organizations are realizing they can move beyond their single server problems and scale out and not up. A good example of the explosive growth is the 2015 Cassandra Summit with over 3500 attendees and speakers from companies like Microsoft, Walmart, Spotify talking about what Apache Cassandra and DataStax Enterprise can do to bring your database infrastructure into the future. Large enterprises everywhere are evaluating how they store and serve data. When they use Apache Cassandra, organizations know they get a highly scaling database with incredible uptime. Looking forward to 2016, there is a lot of excitement about the recent release of version 3.0 with it's major overhaul of the storage engine and support for materialized views. In addition, the increasing momentum around fast data and tight integration with Apache Spark, ensures that Apache Cassandra will be an even hotter topic in 2016."